We often get asked this question, which type of policy is best for me, should I take out a policy through a group insurance scheme (i.e. superfund or my employer) or should I take out an individual policy which I have sourced through my own means. There are a number of differences in the types of policies and considerations your need to review to find the solution that is best for you. Here we have provided you with some great information to help you in navigating this question. In group life insurance the employer or trustee usually takes out a group policy that insures employees or members of a super fund whereas an individual life insurance policy is purchased by an individual for his or her own financial protection. An individual life insurance policy is a policy where you are the policy owner, and you are responsible for paying the insurance premiums; it is not a group scheme. Individual policies can be purchased directly from the insurer or via an adviser (retail) in the Australian market. As you can see form this brief illustration in general “retail” policies are favoured over “Group” and “Direct” polices however this is not always the case as each person’s circumstance is different to everyone else’s therefore it is always best to understand your options and decide which one best meets your requirements. If you still want to understand more about the differences between Group and Retail polices we have put this great resource together for you to read! 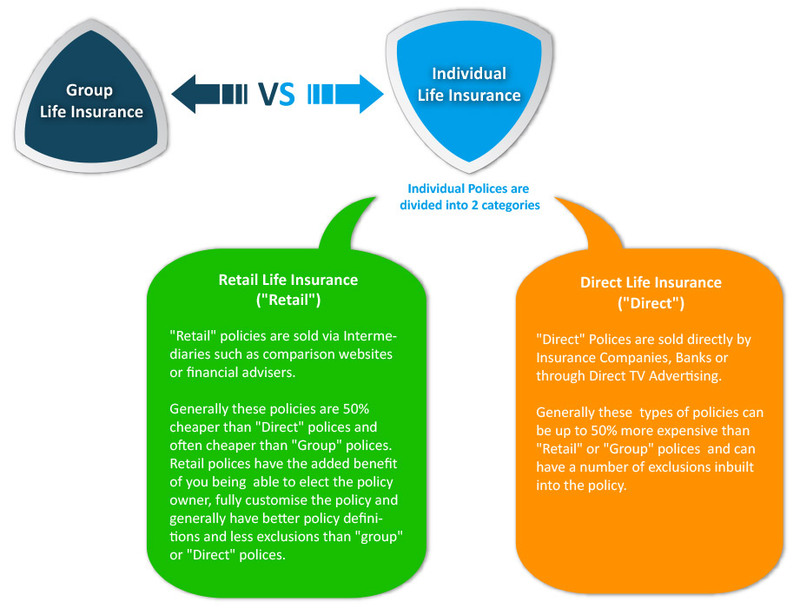 Alternatively if you would like to further understand the differences between the different types of individual polices (Retail vs Direct) available we have put together this amazing resource which is called 10 things you need to know about direct life insurance, here we compare premiums between a number of “retail” and “direct” policies, review premium structures, exclusions and many more points you should consider before you deciding on what type of individual policy you prefer. The difference between Group and Retail life insurance policies is that Group policies are provided by superfunds and employers to their members or staff, the superfund or the employer controls the policy. However Retail policies are provided to individuals through advisers or comparison sites and the policy ownership is determined by the individual taking out the policy. There are a number of considerations you need to be aware of when making this decision. What is a group life insurance policy? When would Group Life Insurance be available? A group life insurance policy is one of the ways in which life insurance can be distributed and are available through a corporate, your employer and master trusts. An example of a group policy would be one that’s been purchased by an employer or trustee of a superannuation fund with the employees or fund members being the life insured. Often policies available through your super fund will be group insurance policies, as rates are negotiated by the super fund on behalf of its members. While group insurance is designed to be offered to thousands of members such as in a super fund, select policies may be able to cater for companies with as little as 20 people. A lump sum benefit paid to you if you become totally and permanent disabled. Cover is generally provided 24 hours a day worldwide. If on secondment overseas, you can generally continue to be covered for up to five years, as long as certain requirements of your employer are met. You may have the option to continue Death Cover as an individual policy if you are no longer covered under the group policy. You will be covered for accidents only while your application for cover is being assessed. Allows you to apply for increased level of cover each 12 months without having to go through medical underwriting again when your circumstances change. Generally your group TPD definition will be ‘Any Occupation’ however you can elect to pay a higher premium and allow for ‘Own Occupation’ and ‘Home Duties’ to be used. Generally a new person joining a group insurance policy will not be required to undergo underwriting and will be eligible for cover up to Automatic Acceptance Limit (AAL). The AAL is a set if criteria or conditions that you must meet in order to be eligible for acceptance. If you want cover above the AAL or you do not meet the criteria, you may be required to submit additional medical information for underwriting. The key difference between group and individual insurance is that an individual insurance policy is taken out by an individual and is customised to suit their situation. This is compared to a Group policy which is taken out by an organisation on behalf of its employees or members and is often a one size fits all approach. Retail Life insurance is a type of fully underwritten policy distributed to customers through financial advisers, comparison websites or brokers. They are generally cheaper, have more features, benefits and generally have a higher claim success rate. You can choose the amount of cover so it suits your circumstances and budget. Typically insurers have no maximum cover limit. Increase each year due to a change in your age but starts off more affordable than level premiums. Start off more expensive than stepped premiums but do not increase each year due to a change in your age. Start off on a stepped level plan but convert to level premiums. You can select to own your policy yourself, giving you control over the policy. Joint ownership is when two or more people own the policy such as a husband and spouse. Cross Ownership allows a husband or wife to own their spouse/partners policy. If you elect to take out cover through your super fund, the super fund becomes the owner of your policy. Take out a combined policy where multiple cover types are combined into the one policy with one premium i.e. a combined life, trauma and TPD policy. Take out individual policies for each cover type i.e. stand alone life, trauma, TPD and income protection policies. One of the major advantages of an individual retail policy is the ability to customise it to suit your needs, including choosing adding any policy options. Select insurers offer free child cover of up to $10,000 covering death, terminal and critical illness. You can generally also elect to take additional cover out for your children of up to $250,000. Pays out a benefit if death is caused by an accident. This can be a stand alone policy or it can be an additional option to a life insurance policy. Business Future Insurability allows you to increase your level of insurance if a significant business events occurs. Pays 1/30th of your monthly benefit for each day you are confined to your bed during your waiting period. If you are totally disabled as a result of an accident and continue to be totally disabled for at least 3 days, you will be paid 1/30th of your monthly benefit each day you are totally disabled. If you go on claim, your monthly benefit will increase, allowing your benefit to keep up with inflation. If you are totally disabled to an extent that you meet the totally and permanently disabled definition, you may elect to receive a lump sum rather than monthly benefit. This option allows you to insure an additional 5% of your income to go towards superannuation contributions. Learnings from the 4 Corners Comminsure allegations. Don’t assume your cover in super is adequate or has appropriate medical or policy definitions. For a company, which is the better option to cover all its employees in one insurance policy. It is retail policies for employees or group medical policy. please suggest. In what case a company can opt for tax exemption? group medical or retail? The policies we discuss in the above article are in relation to group & individual policies in the Australia life insurance market, therefore these policies do not cover “medical expenses” as per say. We don’t have policies that specifically provide “medical expenses” coverage therefore unfortunately I don’t believe we can assist you with your question. Do policies included in super cover pre-existing medical conditions as part of ‘Automatic Acceptance’? Thanks for reaching out Mo. Great Question and I gather you are referring to what is commonly known as ‘Group Life Insurance’ in which a policy is provided by your Employer or Superannuation Fund to which you are a member. Generally, if you meet certain criteria or conditions the policy is provided to you under the Automatic Acceptance Limit (AAL). However, you will likely be limited to the level of cover you can have and to meet certain criteria. For example, the criteria might be Pre-Existing medical conditions or they might require a short disclosure requiring you to advise if you have had consultation with a doctor for cancer in the last 10 years? All Group Life Insurance Policies are provided by different Insurers and it can depend on the number of members which determines the risk the Insurer will accept and subsequently the result for the stipulated requirements for Automatic Acceptance. You could always find out the specific details of your policy by calling your Fund or requesting the PDS.